BetOnHorseRaces.org has negotiated an exclusive bonus with Sports Interaction that gets our visitors who sign up to Sports Interaction through one of our links a 100% matching bonus up to $125 on the first deposit. This is a much improved bonus over the typical 10% matching bonus up to $100 offered by Sports Interaction. The bonus is immediately added to your account after you’ve made your deposit. You must roll over the bonus and deposit 10 times before you are eligible to make a withdrawal. I should also note that you must make a deposit within 7 days of creating your new account in order to get the bonus. Visit SportsInteraction.com now to open an account and claim your bonus. 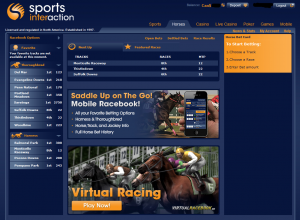 The Sports Interaction Racebook is very easy to navigate and understand. After heading over to the Racebook by clicking on the ‘Horses’ tab in the top navigation bar you will see all of the racetracks with races available for betting in the left sidebar. In the right sidebar there is a simple 3 step guide to let you know how to proceed and place your bets. After you’ve clicked on the racetrack you want to bet on from the left sidebar that track pops up and you can choose from any of the races held at that track for the day. The default bets are the straight wagers (win/place/show) and placing your bets is very easy as you can see below. You can change to the exotic bets by clicking on any of the radio buttons (exacta, trifecta, superfecta, daily double, pick 3, etc). You can see a superfecta example below. As you can see the Sports Interaction racebook layout is extremely easy to navigate and there are plenty of betting options for each race. 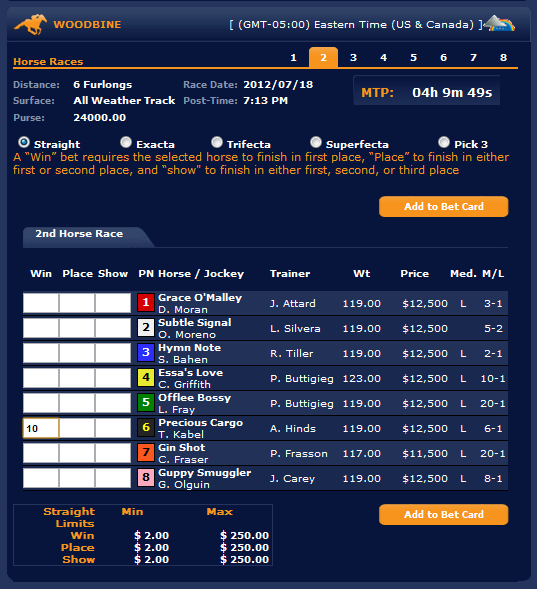 You are also able to favorite certain tracks so they are easy to find when you want to bet. 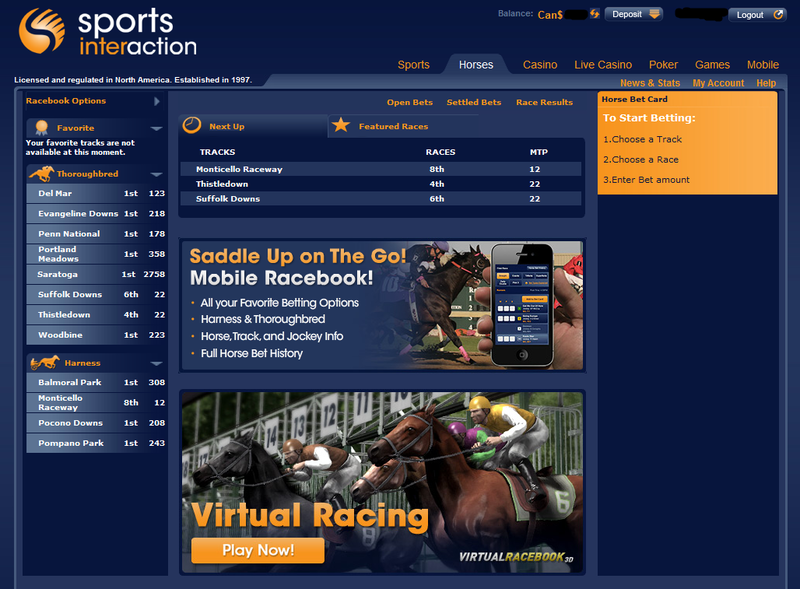 Sports Interaction has their racetracks separated into 3 categories. The payout limit for that particular racetrack is determined by what category the track is in. Category A includes 17 tracks and the payout limit on those tracks is $25,000. There is also a maximum bet of $250 for all bet types in category A. Category B has 22 tracks with a payout limit of $15,000 and a maximum bet of $200. Finally, category C has 49 tracks with a payout limit of $8,000 and a $100 maximum bet. 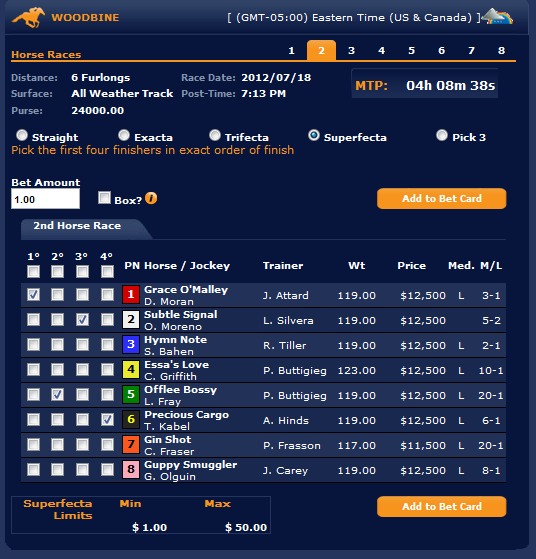 To see the full list of tracks at Sports Interaction and which category they fall into click here, then click on the ‘Horses’ tab and the ‘Racebook Options’ in the top left of the screen, followed by the ‘select favorite tracks’. Sports Interaction has a minimum bet of $2 on all straight and daily double wagers and a minimum bet of $1 on all other exotic wagers. It’s also important to note that exotic bets are capped at 300/1, which means that a $1 exotic bet can only pay out a maximum of $300, regardless of the payout at the track. When there is a jockey change the bets will continue to have action. If the horse scratches though all bets or parts of bets that involve that horse will be refunded. Visit Sports Interaction to start betting on the horses!